This week for The Friday Mashup Holly is bringing us a great challenge...make a masculine card, create a project using the sketch provided or mash it up and create a masculine project using the sketch. I was really happy to see this challenge. I'm not a frilly type of girl and I tend to gravitate towards darker colors, colors more associated with guys I guess! Its just easier for me than trying to figure out what to do with softer, more feminine colors. I used Woodland Walk DSP to go along with the sketch and image. Talk about perfect for this stamp set! 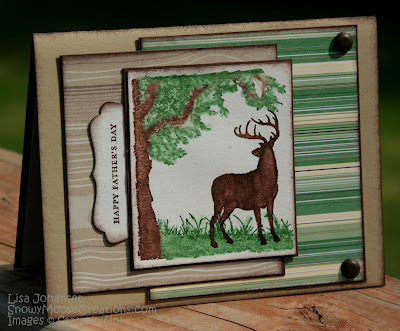 I really like how this came out and I think I'll be giving this card to my hubby for Fathers Day! 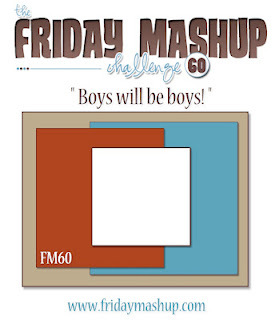 Now that you're done checking out my card why don't you head over to The Friday Mashup and see what the rest of the design team has come up and then play along with us! Great masculine card! I always struggle with cards for guys. Great take on the sketch too. Have a great weekend. What a stately stag, Lisa! And perfect papers for this sketch!